Since Ted Hughes sold a selection of his papers to Emory University in 1997, a kind of lore has built up around the contents of the mysterious sealed trunk (sometimes called a "chest"). Perhaps it has grown, in our collective minds, from being a modest-sized object to something as large as a semi-trailer, hauled on an 18-wheeler, for all the documents we want it to contain. (There is a precedent set for such dreams: Hughes's manuscripts, letters, and notebooks arrived at Emory in 86 boxes and weighed more than 2 tons.) For scholars, this interest is natural. Access to an author's papers is a privilege; and being denied access to materials---for any reason--- understandably raises questions and sparks wonder, often fantastic in nature. As Ted Hughes's agent for both the sale of his own papers to Emory University and those of Sylvia Plath to Smith College, and also as the person who packed the "sealed chest" referred to in your report (April 8), I can satisfy the curiosity of scholars and others about the possibility of Sylvia Plath's missing journal being incarcerated in it. It is not. At the Sylvia Plath Conference in Belfast in November, talk circulated about the trunk following a session in which it was mentioned. Dr. Julie Goodspeed-Chadwick, a professor of English at Indiana University-Purdue University Columbus, asked me if I knew anything about the following: that the trunk had been opened and its contents had been largely incorporated into the collection. I did not and was fairly shocked by the idea of it. We wondered whether there was a list of what was in the trunk. Researchers have wanted to know what Ted Hughes sought to withhold from the rest of his papers and how these sealed papers would contribute to his legacy. Upon writing to Emory to try to find out the fate of the trunk, we learned the following. According to Carrie Hintz, Head of Collection Services at the Stuart A. Rose Manuscript, Archives, & Rare Book Library, "The trunk was opened in 2003 for review by Carol Hughes and Emory Library staff. At that time, some of the contents of the trunk were added to the publicly usable collection and are currently available to research." 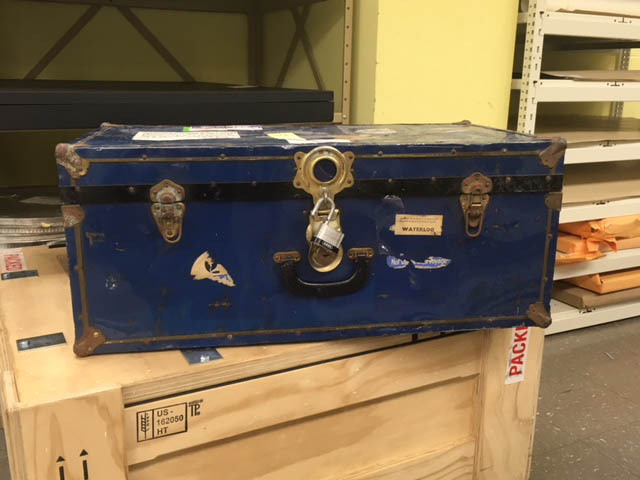 Hintz continued, "I do not have a record of what items, specifically, were originally part of the trunk and have been integrated into the collection. There were also some files relating to a legal matter which were restricted until the death of all associated parties. Those files remain restricted" (email to Peter K. Steinberg, 4 December 2017). Special restrictions apply. Access to selected files is restricted without the written permission of the copyright holder. Other selected files are closed for a period of twenty-five years (2022) or the lifetime of Carol Hughes, whichever is greater. See series scope notes for further details of specific materials covered by these restrictions. This statement has remained unchanged since at least 17 November 2003, when Steinberg saved a copy of the finding aid. Present access restrictions seem only to apply to select letters to Ted Hughes: letters from Janos Csokits and Daniel Weissbort (permission from copyright holder needed) and letters from Seamus Heaney (closed, outright, to researchers). Furthermore, the finding aid states that "other selected letters are also restricted without the permission of the copyright holder." If there were Plath materials in the trunk that were incorporated into her subseries of the Ted Hughes papers when the trunk was unsealed, then browsing the finding aid does not yield any unknown works. This does leave some still unanswered questions in the minds of Plath's (and possibly Hughes's) readers. We know that no Plath-authored materials are sealed in the Hughes trunk at Emory. Are missing creative works (poems, stories, novel[s]) and products of Plath's daily life (letters, journals, calendars) extant somewhere? Where are they? In addition to reaching out to Emory, we made inquiries to the other repositories with large Sylvia Plath archives: Smith College and Indiana University. None have any sealed Sylvia Plath materials. All links accessed 6 December 2017 and 2 February 2018. I've been waiting for this post because you've teased us without mercy! Now I'm not quite sure what it means. Are we excited at the prospect of new material or the fact that the trunk itself exists? Jacqueline: Thank you for your comment. Sorry for the teasing (a little bit)! I think we each are going to take something different from the post and the news. For many, the contents of the trunk have loomed large for nearly 20 years! However, for about 15 years now we've been---for lack of a better way to put it---wasting our time. Many researchers may have unknowingly worked with documents Hughes intended to have sealed. So, in a way there's nothing to actually be excited about as the majority of the papers in the trunk are already open to researchers. But in a way it is also exciting to know we haven't to wait until 2023 to get access to the papers. The "legal matter" is curious. Alina - Frankly none of this stuff matters when it comes to our personal health and outlook and I am truly sorry if the 'legal matter' is a burden to you when you face far more serious and important things in your life. Jo - Thank you for your comment. Agreed. Completely. I must admit when I saw the title of the post and the picture my heart skipped a beat! Strange that TH's wishes were not really respected. At least it's a good thing to know rather than not, I suppose? I had been hoping for the missing journals but after all maybe they are better off lost or destroyed than found... Who knows. Apologize, I wrote "Jo, my thoughts exactly!" But phone-autocorrector wrote "how". Dispiriting, Peter! And infuriating, I would imagine for Hughes scholars. We may have to resign ourselves that we may never read Plath's missing words. From the point of view of context for the Ariel and 1963 poems, it is hugely disappointing.